Division of Glass Marine Industries, Inc. The following specifications, pictures, and diagrams came from the Ocean Masters site. Much of the text was also sourced from that site and edited. Thanks to John at Ocean Masters for his help. The boat pictured, 1967 hull #309, is for sail. Email columbia@oceanmasters.com or check out http://www.oceanmasters.com/columbia.htm for more information. Sail Area 321 sq. ft. The Columbia 26 was one of the earliest models built by Columbia and one of the designs attributed to the company rather than to an individual. It was probably in production until 1969 or 1970 - whenever the Columbia 26 Mk II started production. Columbia made three distinct different 26s. Here is how to identify which Columbia 26 you have. Noel Mattiello's 1966 C-26 #247, Marisol. Notice the long, single port on the side of the main cabin. The C-26 was one of a group of boats of the same style. It is a stretched version of the early C-24s. except that it has an extra 2 feet in the middle of the boat. The cockpit and lazerette appear identical on both boats. A second deadlight forward distinguishes the 26 from the 24. 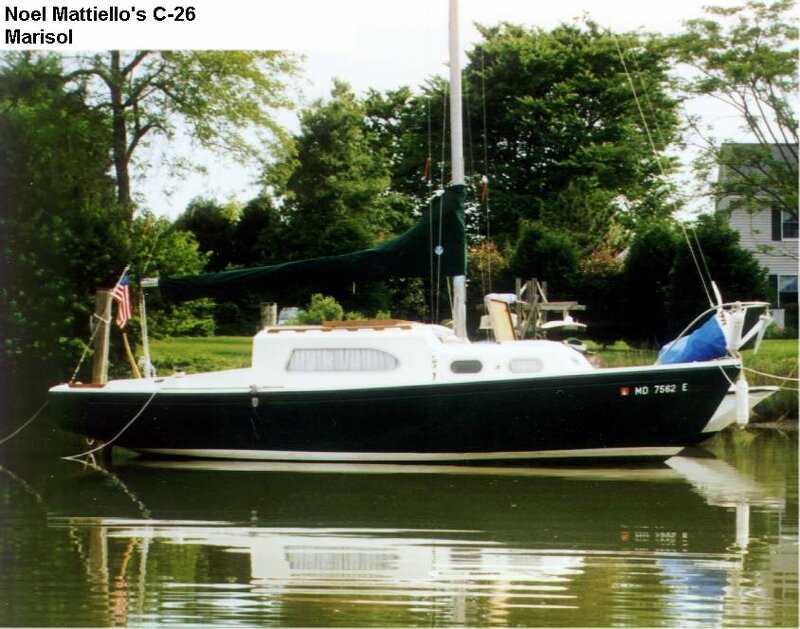 Marcus Jannitto's boat, Windborne, hull #9 has a built-in water tank and head under the v berth like a Columbia 24 and 2 narrow hanging lockers between the v berth and the saloon, then the configuration is like later Columbia 26s. 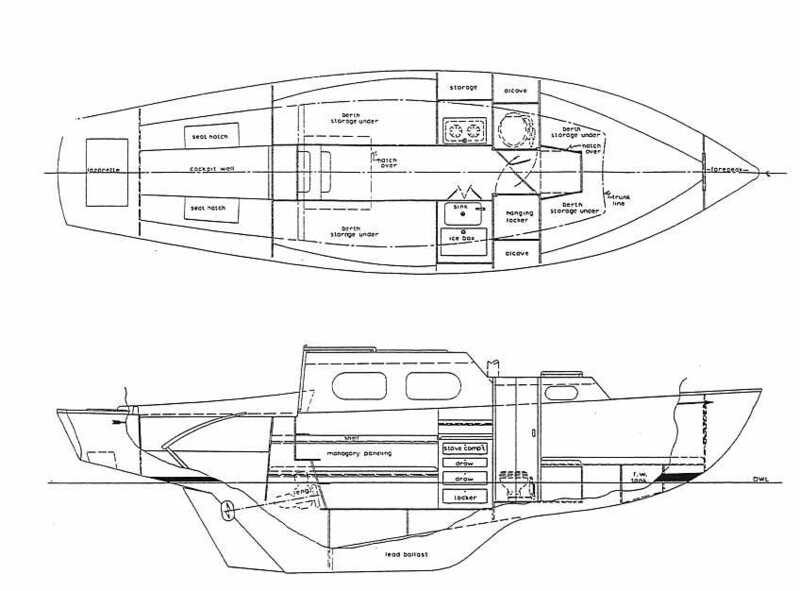 Here is a diagram from an ad in the Sept. 1962 issue of Yachting magazine introducing the 26 and showing this early layout. Later Columbia 26s have a head to port and a hanging locker to starboard just aft of the v berth. The design has a fairly straight sheer, and a narrow, full keel with cutaway forefoot and attached rudder. The sloping bilge and deep sump at the aft end of the keel cause any water which gets inside to collect in the sump. When outfitted with an optional inboard engine mounted below and behind the companionway stairs, the keel and rudder are relieved to accommodate the propeller. 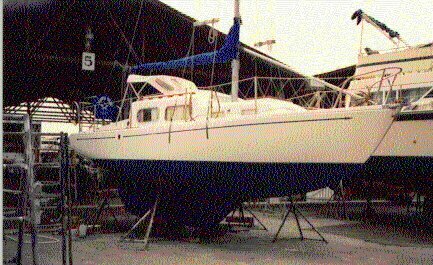 The about 50% of the 26's displacement is lead ballast carried low in the keel. John reports sailing Ivory Star, his 26, in twelve to fourteen foot, quick period seas in the Gulf. It sounds like the crew spent most of the time hanging on for dear life, but the boat handled the abuse without any sign of strain. On another occassion, he sailed with full main and 150% jib in twenty-five knot winds on Tampa Bay to deliberatly try to knock down the boat. They were able to submerse the side decks, but they could not get the mast in the water and no water entered the cockpit! Even if it had, the bridge deck would have kept the cabin dry. Like the 24s, the 26 has a lazerette, with scuppers, separated from the main compartment by a watertight bulkhead. Although the lazerette has a well that accepts a short shaft outboard motor, some owners seal the plug in the well, attach the motor to the transome, and use the lazerette for storage. John says that for, "Someone who...is full of adventurous spirit, but limited financially. Someone who has a champagne desire and a beer pocket book. For that someone Ivory Star is a great minimum cruiser." Sounds like a rousing enodorsement for the early C-26s to me.